One of the most familiar tools for divination in Santeria is the oracle of Obí (sometimes called Biague). Obí divination’s primary use is to answer simply questions with “yes” or “no” answers. 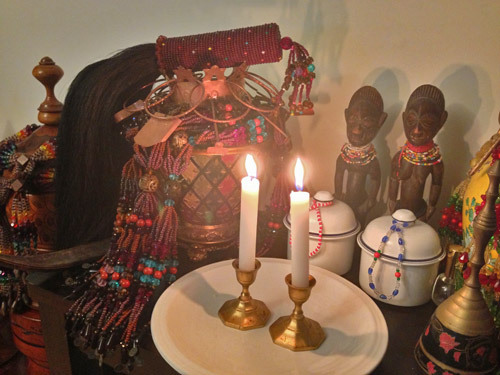 It is most typically used to confirm if offerings are accepted by the orishas or egun, if ceremonies may proceed, or to get a simple yes/no answer to questions about a person’s life. Obí is one of the most widely used forms of divination in the orisha religions, yet it is also one of the most widely misunderstood or misused oracles. We hope to clarify some of the misconceptions around the use of Obí as well as give you a newfound appreciation for this simple but effective divination system. In the future we’ll share an article about how Obí divination is performed, but this article is focused around who Obí is. Obí divination is performed using four pieces of coconut meat in Santería Lukumí, but this oracle has a much older tradition originating in Africa utilizing four pieces of kola nut meat. The kola nut has a brown rough exterior that naturally breaks open revealing lobes of white nut meat inside. In Africa, they use kola nuts that have naturally divided into four lobes. When the Lucumí people were abducted to Cuba, they found themselves in a different climate where many of their native plants did not grow. Kola nuts do not grow on the island of Cuba, and yet the Lucumí people needed to perform Obí divinationto begin restoring their religious practices. They decided to innovate and used coconut meat instead of kola nut meat for Obí. 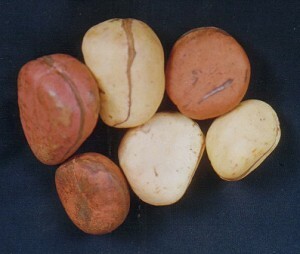 In Africa, kola nuts are used for Obí divination. Kola nuts do not grow in the Caribbean. Coconut was something familiar to the Lukumí people; they called it agbon. By cracking open a coconut and extracting its meat then dividing it into four pieces, they developed a suitable alternative for Obí divination. Over the years, and with the loss of fluency in the Lukumí dialect, Santeria adherents fell into the habit of referring to coconuts as obí since they were being used in the Obí system of divination. But in the strictest sense, the Lukumí word obí actually refers to kola nuts, and agbon is the proper word for coconut. (although you’ll rarely hear anyone call a coconut agbon these days). Obí divination is most properly conducted using four pieces of coconut meat (Lukumí style) or four pieces of kola nut meat (for folks who want to try a more African style of divination). It is completely inappropriate to use four coconut shells – that is an oracle from a completely different religion (chamalongo divination from Palo Monte). It is also inappropriate to use four cowrie shells for obí divination. This seems to be a fairly modern introduction into the United States by groups seeking to reconstruct a system that is closer to traditional Yoruba worship – however a cursory understanding of odu and the patakis associated with Obí will quickly teach you that using items like shells, pennies, buttons or coconut husks is not only improper, but does not even consult the orisha Obí. This pataki (legend) explains why. Obi was an orisha, created by Olofi, who embodied the best of his blessings he could give the Earth. He was kind, patient, always gave to the poor. His spiritual purity made him radiate the purest of white light. All others who men Obí were in awe of his perfection, kindness and wisdom. Obi was sent to act as a remedy for all of the troubles of the world; he was an agent for blessings and goodness. Obi always wore white robes as his preferred garment for they were the color of Olofi’s cool and giving energy. Obi was handsome, with dark black skin, a youthful face and kind eyes. As Obi travelled across the lands all would throw themselves at Obi’s feet, seeking a blessing, a word of wisdom, or perhaps getting the opportunity to touch the hem of his robes. With all of this attention, Obi began to grow vain and arrogant. He started thinking of himself as the most perfect thing alive, rivaling Olofi himself! He began dressing in the most lavish of white robes made in celebration of his own perfection. His giving nature faded and he began scoffing at the poor who would approach him. But Obi didn’t care what those “lesser than” him thought. He was living high on life and he was going to let everyone know about it. Obí is an orisha who was punished for his arrogance. He now only speaks on behalf of the other orishas and has no voice of his own. One day Olofi threw a party and invited all of the orishas to attend. Obi spent weeks preparing for the party. He felt that physical beauty was a blessing from Olofi and he was the most blessed of all. He wanted to make sure everyone in attendance knew it. He dressed himself with extravagant white robes stitched with silver thread and moisturized his cocoa skin with the finest shea butter he could buy. His radiant robes were only eclipsed by the beauty of his flawless black skin. He knew he would make an impression at the party for sure. Word spread across the villages that all of the orishas would be visiting Olofi’s palace that day, and many of the poorest people lined up outside to beg for alms. They hoped they would see Obi and perhaps he would give them a coin or two as was his custom. As Obi approached Olofi’s palace he saw the poor and destitute people outside begging for money and he was disgusted. “How dare they approach me with their filthy clothes and their dirty faces!” he said. He went up to Olofi’s palace guards and told them to keep the poor away from the party. 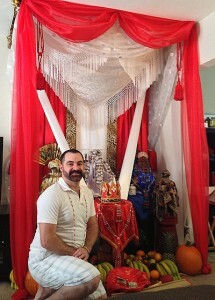 Obi entered the party and saw the orishas arrive one by one. Each orisha wore their finest clothing, but Obi’s sparkling white robes were the most impressive of all. Obi was satisfied with the attention he was receiving, then someone knocked at the door. He answered the door and found a poor, smelly beggar with his hand held out begging for coins. Obí recoiled in horror and shouted “How dare you approach Olofi’s home and stick your filthy hand out at me. You are disgusting and vile! GET OUT OF HERE VERMIN!! !” He shouted so loudly that most of the party’s guests turned to see what was happening. Even Olofi saw what Obi had done. The orishas were horrified at Obi’s conduct. How had an orisha that was once so perfect become so arrogant? The beggar’s appearance at Olofi’s party was such a great irritation to Obi that he couldn’t stop thinking about it. He decided to hold a party of his own in Olofi’s honor and he was going to make sure his guards kept all vagrants far away. Nothing was going to ruin his party. It would be even grander than the one Olofi threw. He decorated his home with gossamer white silk. He had the finest of white exotic flowers imported to grace the halls of his marble mansion. He had his servants sew him a new set of robes made of iridescent white cloth, silver thread and magical fibers so that they would glow like the sun itself. He invited all of the orishas and Olofi. This was going to be the greatest gift he could ever give Olofi and it would prove to everyone that he was the greatest of the orishas on Earth. At the party all of the orishas arrived to see the spectacle. They enjoyed the finest refreshments, food and decorations. They were truly stunned at the gala that Obi had put on for Olofi. They were even more amazed at his garments that seemed to rival the very radiance of Olofi himself. Yet Olofi had not arrived yet. Obí assumed he would arrive last as was custom for the guest of honor at any function. As Obí was mingling with his guests he heard a knock at the door. He opened the door and found a dirty beggar dressed in rags at the door with his leprous hand held out asking for alms. Obí was furious! He had taken every precaution to make sure the poor wouldn’t mar his event like they had the last. He blew up in the face of the beggar. “WHAT ARE YOU DOING HERE YOU FILTHY DISGUSTING VAGRANT!? GET OFF MY DOORSTEP!! YOU ARE THE WORTHLESS SCUM OF THE EARTH!” and he slammed the door in the face of the beggar. He turned to face the other orishas and they were stunned. Many stood with their mouths wide open in horror. Elegguá spoke up and said, “Obí, how could you address our father Olofi like that? !” Obi was so enraged that Eleggua’s words hadn’t registered in his mind. Another feeble knock came at the door and Obí spun around and flung the door open saying, “DIDN’T I TELL YOU TO GET THE HELL OUT!!? !” When Obí looked at the vagrant on his doorstep, the man’s image dissolved away to reveal the glowing purity of Olofi standing in his place. Realizing what he had done, Obí threw himself on the floor at Olofi’s feet. Olofi picked him up and said, “You have lost your way Obí. You were once my most beloved and perfect creation. I gave you my ashé, a sweet voice, a beautiful face and the purity of heart to act as my ambassador on the Earth. But you became vain and arrogant with time. Because of your arrogance, I take away your voice. From now on you will not speak for yourself, but you will only speak what the other orishas want you to speak. As you have thrown yourself at my feet, from now on you will only communicate when you are thrown on the floor in deference to your master. I strip away your exterior beauty, but I cannot take away the ashé I have given you. From here forward you will be ugly and your skin will be coarse and dark, but inside you will always be white as a reminder to the world that your original intent was to represent my purity. As your punishment you will always fall to the earth, over and over again, as a symbol of your fall from grace. Thus was born the coconut (or kola nut). 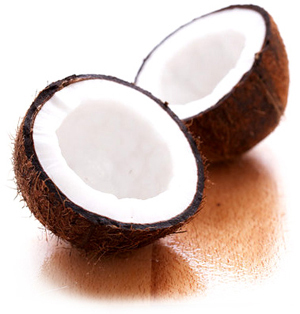 The coconut which is dark and coarse on the outside but white on the inside. Obí only speaks when it is thrown on the floor and even then, he only says what the other orishas say. Yet, in spite of his divine punishment, his nature is still to be pure, and his purpose to take away the evil of the world carries on. 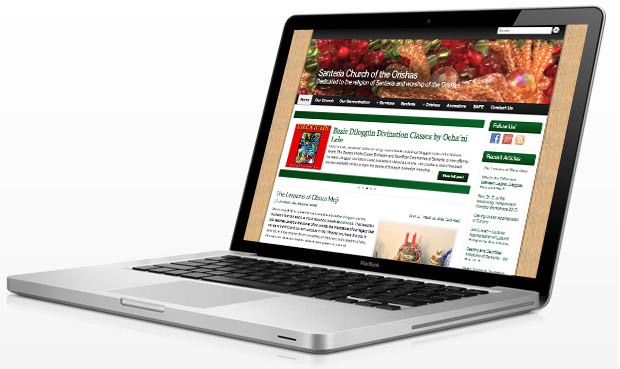 As such, obí can soothe osogbo and remove spiritual heat, but his only purpose is as a servant for the orishas. The legend of Obí clearly explains what is and what is not acceptable to use for Obí. First, it must be dark and coarse on the outside, white on the inside, and fall every day to earth (like a seed or nut from a tree). It can only speak for other orishas – it has no voice of its own. In fact its voice was taken away as a punishment from Olofi. It can only speak when it is thrown on the floor – not a table. This is a direct reference to Obí prostrating himself on the earth before Olofi when he realized his shameful actions. Obi can only be used for yes/no questions. 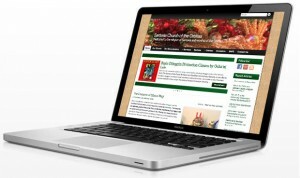 Utilizing Obí to answer deeper questions beyond yes/no is a complete misuse of the tool. Attempting to use Obí to conduct an entire reading for a person’s life circumstances is also inappropriate. That person should instead seek a diloggún reading or a reading from Ifá. Who Can Perform Obí Divination? This is a bit of a complex question to answer. Obí, by its nature only speaks on behalf of other orishas. In order to communicate with any orisha, a person must be able to recite the Moyuba prayer (also called Mojuba or the Juba prayer). One of the requirements for a Moyuba is the ability to call upon one’s initiatory lineage. Without kariocha, a person has no initiatory lineage, and therefore they cannot Moyuba, and they cannot divine with Obí. In our church lineage we do not allow aborishas to read Obí, we only permit Olorishas to read Obí. There are some lineages who permit those that have received warriors (aborishas) to read Obí to determine if an offering is acceptable, but they should limit their readings to simple things, and they should most certainly NOT use Obí to read for others as they have no lineage or ashe to be solving other people’s problems. This is the role of a priest or priestess, and not a layperson like an Aborisha. 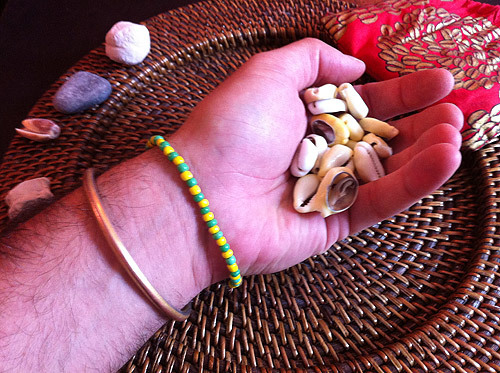 We do not recommend the use of alternative methods of reading “Obí” like tossing four cowries or four coins because these methods are not Obí and as such, there is no assurance that the oracle will answer truthfully – it is not a dependable oracle for it is not supported by pataki, nor by the information contained in odu. 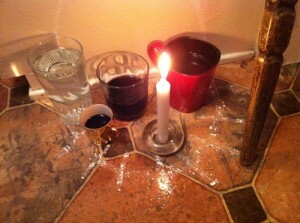 An offering of obí and fresh water is given to the orisha Yemaya. One half is filled with honey, the other is filled with cane syrup. Obi is energetically cool and has the power to placate osogbo. 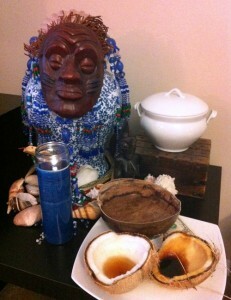 As such, Obí is a good offering to the orishas in the form of addimú. 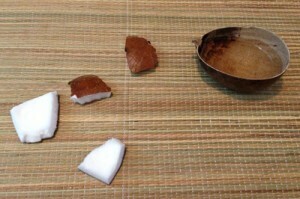 When offering Obí to the orishas it is common to simply take a coconut (or kola nut) and crack it open into two pieces. I often fill each piece with some of the items that orisha would enjoy. For Elegguá I would fill one half with rum and the other half with honey. For Changó I might fill one half with white wine and the other with honey. It is also a good idea to offer a gourd full of cool fresh water at the same time the opened coconut is offered to the orisha. Leave the offering there for the required number of days as determined through divination, then dispose of it in nature where the divination indicated would be appropriate. This is a great way to soothe and cool any osogbos (misfortunes). It also gives the orisha Obí an opportunity to be of service to the orishas, and to reveal his true nature as a representative of Olofi’s ashe whose original intent was to soothe all that ails the world.